Cruciate disease is a very common orthopaedic disorder of the knee ( stifle) of dogs. Inside the canine knee, there are two crossing ligaments that join the tibia and the femur. These are known as the cranial and caudal cruciate ligaments. The cranial cruciate ligament, in particular, is an important stabilizer of the knee joint. The cranial cruciate ligament prevents the movement of the tibia forward out from underneath the femur. A complete or partial rupture of the cranial ligament leads to joint instability and lameness. If left untreated this will result in progressive degenerative arthritis, as unnatural movement damages protective joint cartilage and the special spacers in the knee, the menisci. How does cruciate disease occur? In humans, cruciate ligament rupture often occurs as a result of sudden unnatural movement in the knee joint. In dogs cruciate ligament rupture is generally the result of a chronic gradual weakening of the ligament. It is a degenerative condition. There are many factors that may contribute to the weakening of the cruciate ligaments. These include: age of desex, individual variation in the shape of the femur and tibia, low grade inflammatory disease of the joint, obesity, some endocrine diseases (Cushings Disease) and genetics among other possible contributors. What is clear, is that once the cranial cruciate ligament starts to fray, the degenerative process accelerates and the meniscus is in danger of being torn. If one hindlimb is affected by cruciate disease it is most than likely the other hindlimb will also be affected. This means that animals that rupture the anterior cruciate ligament in one leg have a high chance of rupturing the ligament in the other leg in the future. If the patient has a dislocating patella (knee cap) the risk is increased. Any hindlimb lameness can be sign of cruciate disease. This lameness may occur suddenly, or may gradually increase in severity. Usually the underlying disease process is well advanced before owners notice anything particularly abnormal. Dogs with cranial cruciate ligament injury may also sit with the affected hindleg out to the side indicating that is uncomfortable to bend the knee normally. A full physical examination is performed by your veterinarian. In particular, your vet will examine the knee joint looking for any swelling or thickening of the tissues. They may test the stability of the knee joint to for evidence of ligament rupture, but this is often difficult to do with the patient awake. If your vet is suspicious of cruciate disease they will recommend radiographs and physical examination of the knee under sedation. The cruciate ligament itself cannot be seen on radiographs, but arthritic changes to the bone and changes to the soft tissues of the joint may be observed if a rupture has occurred. Cruciate ligament surgery for dogs is highly recommended for the treatment of a cruciate ligament rupture. The ligament can never regrow or repair itself, and unless surgery is performed the knee joint will remain unstable and degenerative arthritis will progress relentlessly. There are many surgical options available as part of the management of cranial cruciate ligament disease. 1) Lateral Suture Techniques in which a synthetic band is applied just outside the joint to mimic the action of ligament. 2) Bone Leveling Procedures which alter the geometry of the knee and allow it to function successfully without a ligament. Below is a description of some of the surgical techniques that may be used to assist patients with cruciate ligament disease. Based on your dog’s breed, size, weight and x-rays results, your vet will recommend which technique is most suitable for your dog. This technique involves the use of a prosthetic nylon ligament placed just outside the knee joint. The artificial ligament helps to prevent the forward motion of the tibia from underneath the femur when the patient walks ( like the cranial cruciate) Lateral Suture will ultimately break down but in the appropriate patients, it works well to stabilise the knee until the healing and scar tissue from the surgery provide enough support for the patient. For this reason, the Lateral Suture procedure is generally only performed in selected smaller dogs or cats. Lateral Suture cruciate repair is performed at Southern Cross Vets by our own surgeons. For each of these different cuts are made in the top of lower bone (tibia) in order to make the cranial cruciate ligament unnecessary. In each case, metal implants are placed into the leg and as with all orthopaedic procedures, a small number of patients may have complications as they recover. Complications are not at all common but may include fracture of the tibial tuberosity and implant infection post surgery. Each of these procedures has a high success rate and most surgeons choose to select one of the procedures and develop great skill with that procedure, which results in the optimal outcome for the patient. TTO stands for Triple Tibial Osteotomy. 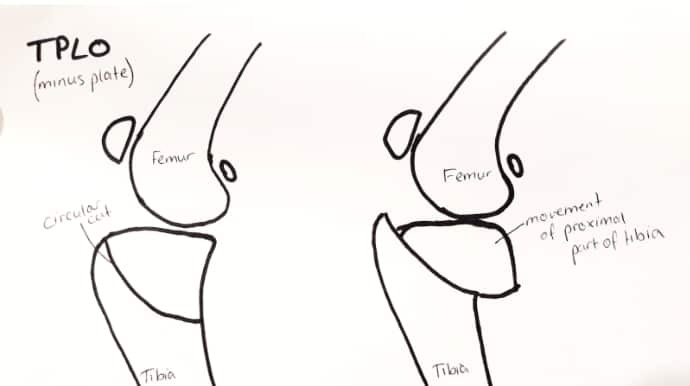 The technique works by advancing the tibial tuberosity and realigning the tibial plateau of the knee. During the surgery, the knee joint is opened and the delicate cartilages inside are examined. The remnants of the torn ligament may be removed, along with any damaged cartilage menisci present. An incision is then made vertically through the tibia (see diagram). A very small horizontal wedge of bone is also taken from within the tibia. The gap left by the wedge is gently closed by moving the edges of the bone together. This pushes out the tibial tuberosity and realigns the knee joint. A metal plate is screwed over the tibia to hold the changes in place and a bone graft is placed into the newly created gap in the bone. The surgeon will then suture closed the wound and take x-rays to confirm that the plate and bone lie in the correct position. TTO is routinely performed at Southern Cross Vets by one of our own surgeons, Dr. Ed. as well as our Visiting Surgeon. Like a TTO, the procedure modifies the knee joint to eliminate the need for a cranial ligament. In a TPLO a circular cut is made through the tibia. The top of the tibia is rotated down and secured in position with a metal plate to level the tibial plateau of the knee. TPLOs are performed at Southern Cross Vets by a contracted or specialist surgeon. TTA stands for Tibial Tuberosity Advancement. 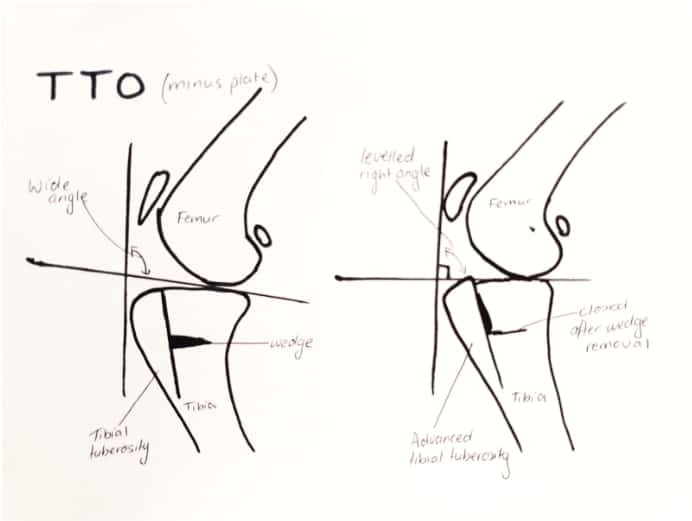 Similar to TTO and TPLO, TTA aims to permanently alter the knee joint to stabilize it without a ligament. An incision is made through the tibia parallel to the tibial crest. 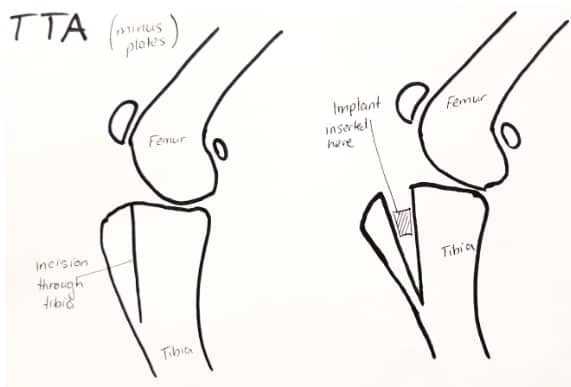 A cage implant is inserted between the tibial tuberosity and the bulk of the tibia to advance the tibial tuberosity. Over time bone grows into the cage implant and the implant is incorporated as part of the bone. Removal of TTA implants can be difficult if complications develop bone has started to grow into the implanted mesh. Most dogs will return to normal function by 16 weeks post surgery. For the first 6 weeks, strict crate confinement is required. This minimizes movement and allows the bone to heal correctly in its new position. You may be asked to perform physiotherapy exercise and massage the leg during this time. At the 6-8 week mark repeat x-rays are taken to check bone healing. Gradual return to exercise begins at 6-8 weeks after x-rays. The aim of dog cruciate surgery recovery is to return to as close to 100% function as possible. Correct stabilization of the knee is important to minimize the development of arthritis. Unfortunately, in all cases of cruciate disease, some degree of arthritis is inevitable. Opting for the best surgery for your dog will likely be the difference between manageable arthritis in the distant future and unmanageable painful arthritis in the near future. Why Choose Southern Cross Veterinary Clinic? We have fully trained staff that work to a high standard of care. We treat every patient as if they were our own and ensure that their experience at the vets is as stress-free as possible. All patients are monitored throughout their anaesthetics by a fully qualified nurse. We ensure that your pet’s anaesthetic is suited to their needs, ensuring that every patient gets treated as an individual. We promise to update you regularly throughout the day. We know how stressful it can be to leave your pet at the vet and want to ensure that we keep your mind at rest. Everything we do is with the goal of making high-quality care for your pet affordable, whatever your budget. How much does cruciate surgery cost? Southern Cross Veterinary Clinic have a package deal to cover cruciate surgery. This package includes a free pre-operative assessment, the preoperative x-rays and sedation, the procedure itself and all post-op procedures including physiotherapy treatment. We encourage our medical staff to continue their education in specialist fields in order to expand their knowledge and keep it up to date. Our aim is to discuss all aspects of your pet’s health with you, offering you all the options that are available in treatment and prevention. The preoperative assessment will include a full health examination and discussion of your dog’s condition. Once we have established the severity of the cruciate disease through radiographs, we will book your dog in for surgery. We will ask that you bring your dog into us during the morning, and surgery will be performed that day. You will receive regular phone updates to let you know how your dog is getting on. Once the surgery is completed, we will keep your dog comfortable with pain relief and allow them to recover in our recovery area. We will keep your dog overnight to ensure they are fully recovered before returning home. At discharge, we will discuss your dog’s procedure with you and explain any post-operative medications. We will ask that your dog is kept quiet and has restricted exercise to allow the cruciate to heal. We will also discuss post-operative physiotherapy and the benefits of hydrotherapy.